Scotland has thousands of free-standing tower houses, and they come in a variety of shapes and sizes. But only one of them is circular: Orchardton Tower, a remarkably complete structure found next to a minor road off the A711 a few miles south of Dalbeattie. 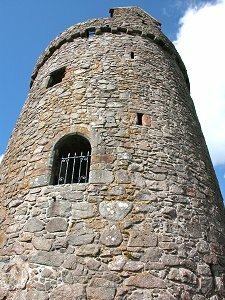 Though unique in Scotland, there are a number of circular tower houses in Ireland and it is thought that the inspiration for Orchardton may have come from there. Perhaps the oddest thing about Orchardton is that despite its uniqueness, it feels remarkably familiar. This may come from the striking similarity in basic shape to the 500 brochs that dot the Highlands and Islands, defensive domestic structures built up to 2,000 years earlier like Mousa Broch in Sheland, Dun Carloway in the Western Isles or the Broch of Gurness in Orkney. 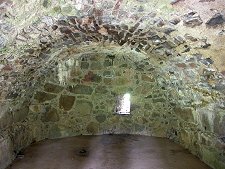 Walking clockwise around the tower brings you first to a low stone door leading to the vaulted cellar. 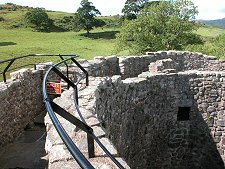 On the far side of the tower a set of stone steps leads up to a doorway into the main body of the tower, a circular space 17ft in diameter. This is equipped with a fireplace and a moulded piscina, probably recycled from an ancient chapel, plus two window recesses. 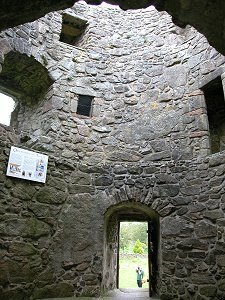 One of these was converted into the current doorway relatively recently: entry was originally via a set of steps from the range of outbuildings and a removable bridge to a door in the tower on that side. There were originally two further floors above the first floor, but their wooden floors and ceilings have long since disappeared. It is possible, however, to climb a spiral staircase contained within the thickness of the wall to a caphouse. 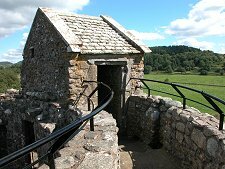 From here you can make your way around a short stretch of the wall walk, enjoying the views of the surrounding countryside or simply seeing at the tower and the outbuildings from a different perspective. Orchardton Tower stands some 33ft high. 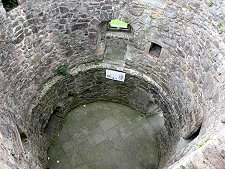 At its base it has an outer diameter of 29ft including walls that vary between 9ft and 6ft thick in the cellar. 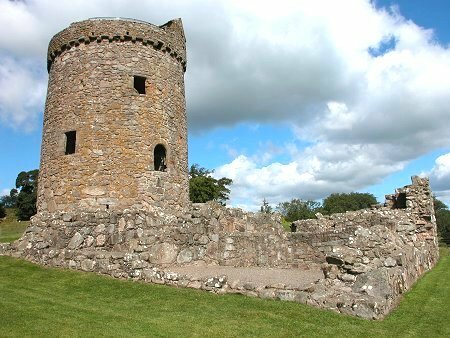 The tower actually tapers with height, again reminiscent of a broch, narrowing to an outside diameter of 27ft 6in at the wall head, including walls only 5ft thick. 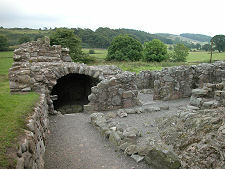 This narrowing of the walls produces another unique feature at Orchardton. 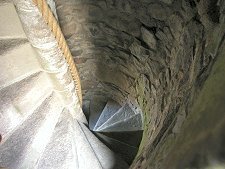 If Scotland has a narrower and tighter spiral staircase, we have yet to find it: this one has a diameter at the bottom of 4ft 8in, and seems to get smaller as you climb. The outbuildings are largely ruined, but seem to have been two storeys tall. 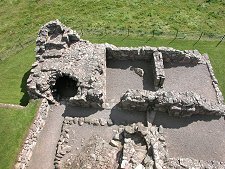 They would have included a hall for the lord's use, plus services like the kitchen and brewhouse. 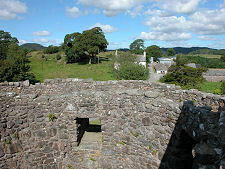 Orchardton Tower was built by John Cairns, probably soon after he retired to his Galloway estates in 1456. 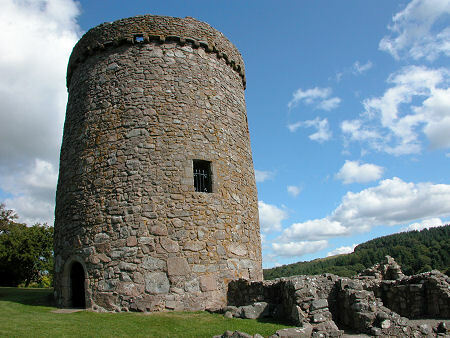 The tower stayed with the Cairns family for a century. It was then passed to the Crown in 1555 pending the resolution of a messy succession that left the tower and estate divided between several daughters and their husbands. It took until 1615 for all the shares in the estate and the tower to be brought together again, by Sir Robert Maxwell, 1st Baronet of Orchardton. The Maxwells continued to live at Orchardton until the 7th Baronet started work on a new mansion two miles away in 1765. The costs bankrupted him and in 1785 he sold his estate, including Orchardton Tower, to James Douglas, a Liverpool merchant. In 1878 his successor William Robinson-Douglas demolished and rebuilt the mansion that had been started in 1765. 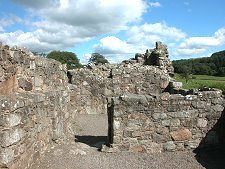 Orchardton Tower's story offers none of the sieges, battles, murders or ghosts that enliven so many other Scottish castles. But it was not completely without incident. The Sir Robert Maxwell who held the Baronetcy in 1745 (the Maxwells did not strive for originality in the names they gave their first-born) was on the losing side at the Battle of Culloden. He was wounded, captured and taken to Carlisle for execution. However, among his papers was his commission in the French Army. As a result he was treated as a prisoner of war and later sent to France. He eventually returned to Orchardton, and his story became the inspiration for Sir Walter Scott's novel Guy Mannering, or The Astrologer.